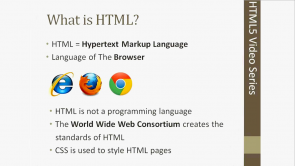 HTML5 | Try Online Course for Free! HTML5 is one of the hottest web technologies right now and is widely gaining acceptance across mobile and web offers. This online course provides all the resources to get you started on application development for HTML5. You are going to work on actual examples, going through important concepts required for through knowledge. By the end of this course, you will be able to create HTML websites and use CSS in your work. You will have profound knowledge about HTML5 and HTML5 application development. Prior knowledge is not needed as your lecturers will go through the concepts from a beginner's point of view.